In July 2016, Swiss International Air Lines (SWISS) became the launch customer of the Bombardier C-Series (now known as the Airbus A220) and currently operates 28 examples; with the fleet comprising 8 CS100s and 20 CS300s. They have proven to be a worthy replacement for the airline's former fleet of Avro RJ100s, which at one time was the largest in the world. 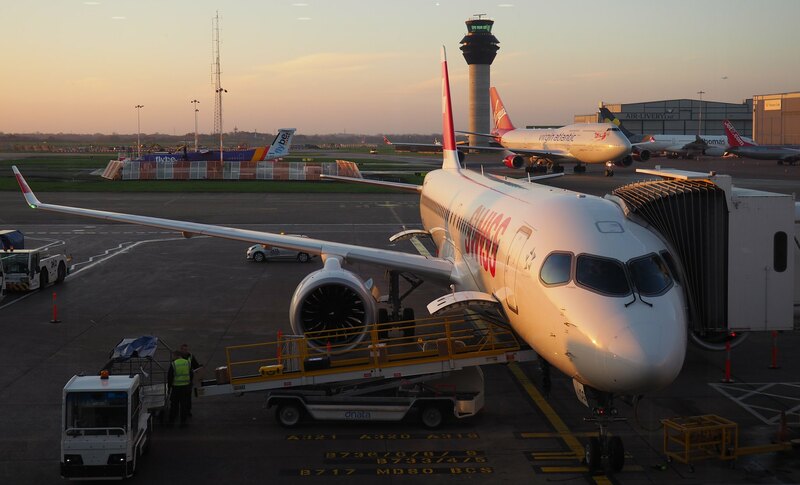 I was keen to try out the C-Series for myself, so, with a trip to Warsaw on the horizon, I was able to work out an itinerary which, at the time of booking, would include three flights aboard the CS300 and one flight aboard the CS100. As you shall discover later, the CS100 flight unfortunately was not meant to be. I originally purchased an 'Economy Classic' return ticket from Manchester to Zürich around two months prior to my trip at a cost of £184. 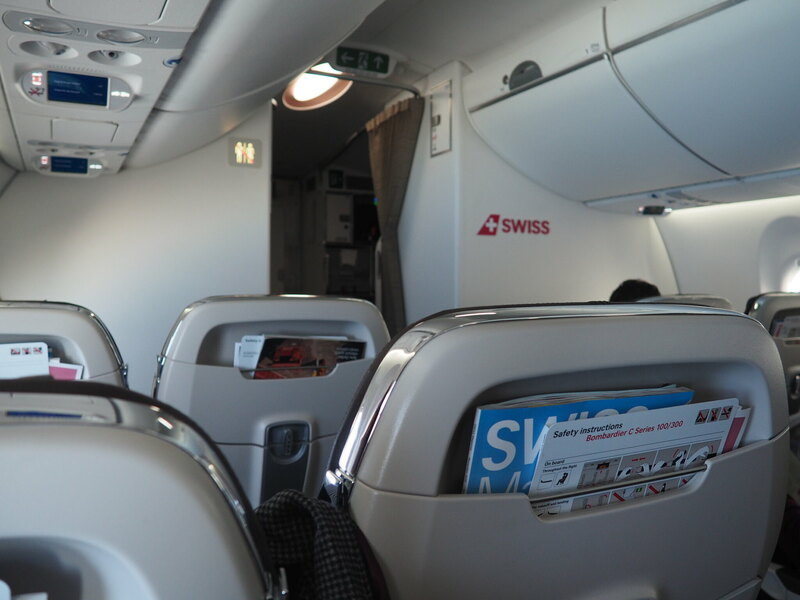 This fare represents SWISS' "bundled" economy offering and includes complimentary advance seat selection and a hold baggage allowance of 23kg/50lbs per passenger. 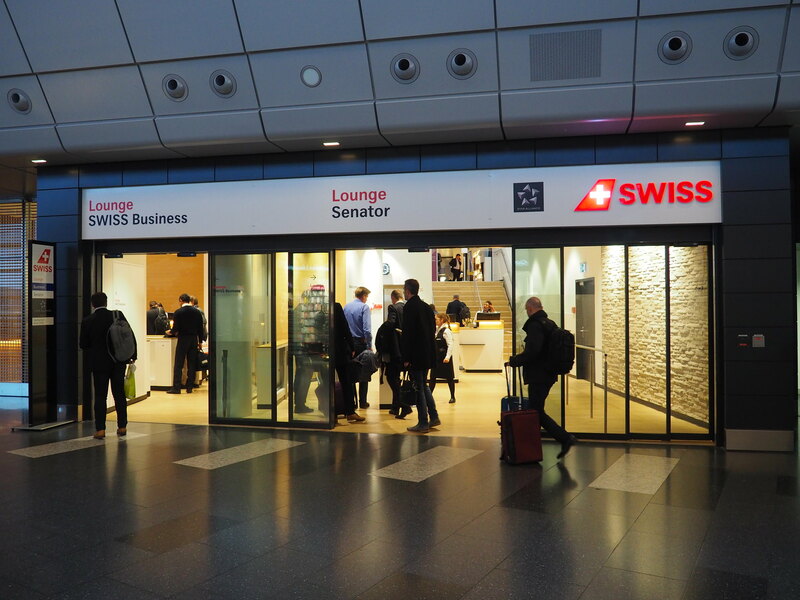 SWISS, however, offers the opportunity to purchase upgrades to Business Class up to 24 hours prior to departure. Because the supplements were very reasonable (£116 for both outbound flights and only £64 for both inbound flights), I upgraded to Business Class around two weeks prior to departure. A 5-Star Airport Manchester is not. SWISS and other Lufthansa Group airlines operate out of Terminal 1, which is dingy, chaotic and rather claustrophobic. Priority check-in and security clearance were nevertheless swift and I soon found myself in a shopping mall masquerading as a departures lounge. Above: SWISS Business Class passengers are permitted access to Terminal 3's Aspire Lounge, and it was here that I had a quick breakfast. While the lounge decor is rather nice and understated, there is a major drawback to this facility: There are no toilets inside the lounge itself - they are located nearby, but passengers must exit the lounge to use them. Above: At around 08:00, I made my way to Gate 25 to find HB-JCG being prepared for the flight to Zürich. This CS300 first flew in December 2017, making it less than one year old at the time of my flight. Boarding began on time and I was among the first to enter the aircraft. The Maitre de Cabine offered a friendly welcome at the cabin door and I was immediately impressed by the light, airy, spacious cabin and ample overhead bin space. The cabin is arranged in a 2-3 configuration. Business Class passengers are guaranteed a free adjacent seat, which creates a de-facto 1-2 layout, but the overall configuration is the same as Economy. The final photograph was taken on a later flight, but has been included to illustrate the cabin layout and the spacious, airy nature thereof. Business Class passengers were offered a small bottle of water and a cold wipe prior to pushback - while this offering is not quite as substantial as the Pre-Departure Beverage service one might expect on an American carrier, it was nonetheless much appreciated. The Captain and Purser soon made their respective welcome announcements and informed passengers of an expected flight duration of 1hr40. Pushback was roughly on time, the Pratt and Whitney PW1000G Geared Turbofan (GTF) engines fired up with a distinctive wailing sonority and we began our taxi to Runway 23L, lining up behind a Flybe Dash 8 Q400. A powerful and swift takeoff was followed by a surprisingly steep climb into the clear skies above Greater Manchester. Nevertheless, the cabin remained notably peaceful - the ultra-quiet GTF is at the cutting edge of engine design and guarantees a pleasant cabin ambience for passengers. Above: The cabin, shortly after takeoff. Above: A beautiful morning view over Greater Manchester. The in-flight service began as soon as the seatbelt signs were turned off. For passengers in Business Class, this was marked by the distribution of cutlery in preparation for breakfast. Economy Class passengers, meanwhile, received a hearty snack and their choice of beverage. Above: A fine hot breakfast, consisting of Omelette served with Asparagus and Mushrooms, a selection of Swiss Cheese, Yoghurt with Granola, a Glass of Water and a Mug of Coffee which was promptly refilled as soon as I finished it. Fresh Croissants were also offered, but I chose to decline on this occasion. I found the quality of the food to be beyond my expectations and the quantity more than adequate for a flight of less than two hours. Upon conclusion of the meal service, Duty Free was offered for purchase. Unfortunately, the crew were unable to find any model aircraft in stock onboard, but helpfully suggested how I might go about finding such an item at Zürich Airport or online. By the time I had finished my coffee and browsed the in-flight magazine, the view from the window of the Alps in the distance confirmed that we were nearing Switzerland. Soon afterwards, the Flight Attendants began preparing the cabin for landing. Above: Murky weather above Zürich Kanton during final approach. Note the sizable Victorinox advertisement in the field below our aircraft. Following a firm landing, we taxied to a remote stand, where we parked alongside a quartet of Helvetic Airways E-Jets, which operate on behalf of SWISS. SWISS provides a dedicated transfer service for Business Class passengers when their aircraft arrives at a remote parking position. Having thanked the crew for their excellent service, I boarded the dedicated Business Class bus with around six other passengers and was whisked away to the Terminal. 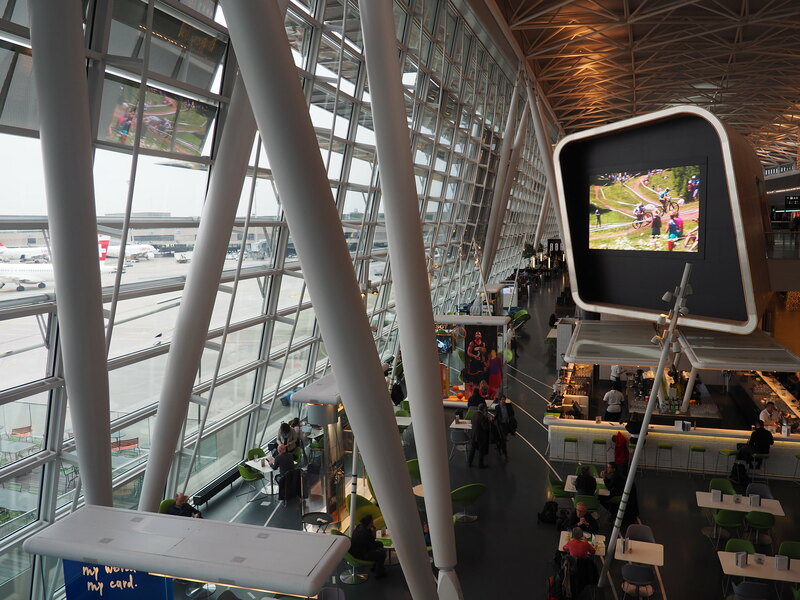 As my connecting flight would depart from the Schengen Zone, it was necessary to clear Swiss Passport Control, which was swift and hassle-free. Above: Zürich Airport's 'Airside Center'. I found the airport to be efficient, clean and functional. Walking distances are fairly short and the overall ambience is relaxed and refined - in complete contrast to Manchester! Above: At this point in my review, I should perhaps admit that my chosen route from Manchester to Warsaw was neither the shortest nor most convenient. 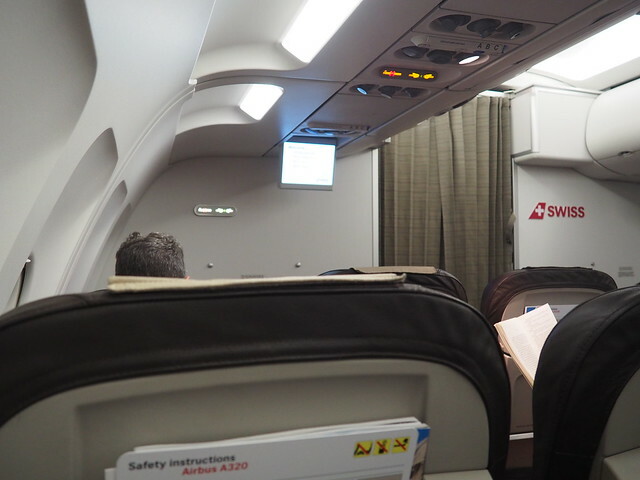 However, such was my desire to fly aboard the C-Series that I willingly booked an itinerary with a layover of more than five hours in Zürich. I decided to save the airport's famous viewing terrace for my return journey and made my way directly to the SWISS Business Lounge. I was impressed by the presence of a Chef in the Business Lounge, but less impressed that the hot food options were limited to pasta and chicken nuggets. An extensive range of beverages was available, including some quite excellent Swiss Wine, which is extremely hard to come by in other countries as Switzerland retains the vast majority of wine produced in the country for domestic consumption and exports most of the rest to Germany. 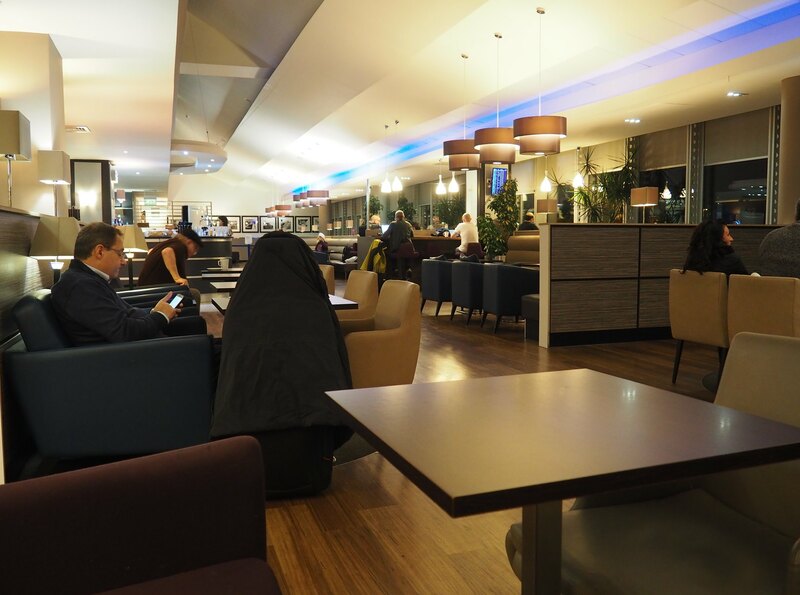 Having explored the lounge as far as possible, I spent an enjoyable afternoon relaxing and catching up on some work while availing myself of the snack and beverage counters. Sometime in the mid-afternoon, while checking the status of my connecting flight to Warsaw, I discovered to my disappointment that the originally-scheduled CS100 had been substituted by an Airbus A320. This meant that the type would no longer feature in my itinerary, as both of my return flights were scheduled aboard the CS300. With my flight to Warsaw due to depart at 17:15, I made my way to Gate B09 in good time. As it turned out, this was a bus gate. Although SWISS provides an excellent minibus transfer service for Business Class passengers on arrival, this is not the case on departure and there is no priority boarding when embarking from a bus gate. This was no big deal, as I hoped to take some pictures of the aircraft on the Tarmac anyway and was more than happy to snap away while others boarded ahead of me. Above: HB-IJP was to carry me to Warsaw on this occasion. 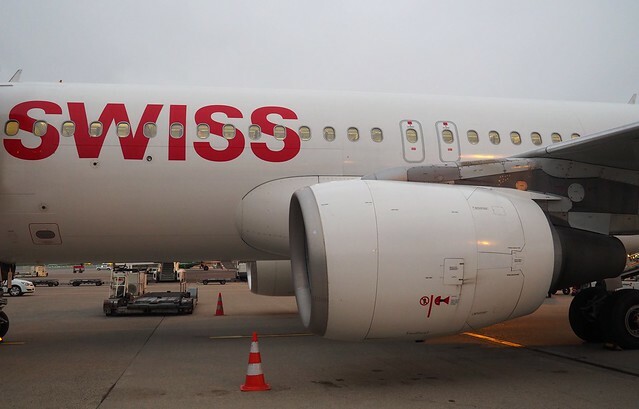 This Airbus A320 first flew in April 1997 and is an original Swissair machine. In my mind, the pedigree of this airframe (I have a long held affinity and fascination with Swissair) more than made up for it having replaced the CS100. As on my previous flight, I received a friendly welcome at the door, followed shortly afterwards by a cold towel and a bottle of water. After the three busloads of passengers had arrived, the Captain welcomed passengers aboard and announced a 15 minute delay due to crowded airspace. Thereafter, the Maitre de Cabine confirmed a flying time of 1hr45. Once 15 minutes had elapsed (the Swiss are very precise with their estimations! ), the engines were started and we taxied to Runway 28. My notes from this flight describe the following takeoff as "powerful" and my review of the video footage confirms that we became airborne in 25 seconds from a standing start. Alas, this being a night-time departure, there was little to see out of the window during our ascent. The Cruise Altitude during this flight was 37,000ft and our route took us over Salzburg and Vienna, before crossing over the Czech Republic and into Polish airspace. Above: Cabin impression. Like that of the C-Series, it was impeccably cleaned and well-maintained, though not quite as airy and modern. 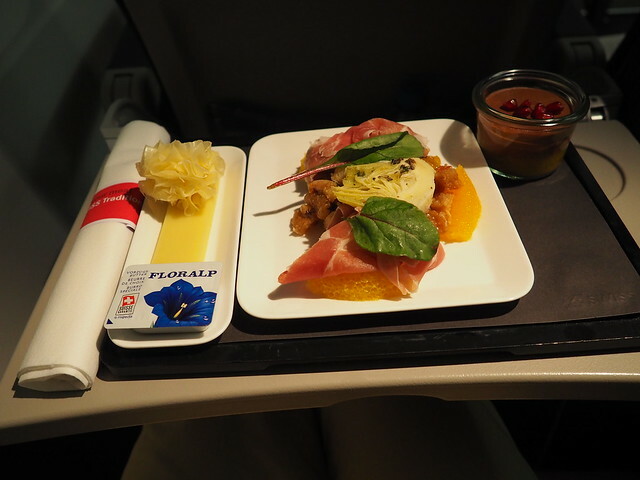 Above: A light evening meal was served soon after takeoff. It consisted of a Walnut Salad, a side plate of Swiss Cheese and a Chocolate Dessert. A selection of Fresh Bread was also available and I chose to pair the meal with a glass of Swiss Red Wine. This meal could have been better. The wine and dessert were both excellent, but the salad was somewhat disappointing in taste. Nevertheless, the service from the crew was polished, attentive and impeccable. Having finished my meal, I was immediately offered a digestif and asked for a glass of Baileys with ice. I then took some time to relax and peruse the in-flight magazine. Again, I really must compliment the crew for their pro-active nature; I was offered a second glass of Baileys almost immediately after having finished the first. The famous Swiss Chocolates (which for some reason had been lacking on my first flight) were distributed shortly before landing along with a card extending an invitation to review the flight. With that, the in-flight service was concluded and we landed firmly at Warsaw Chopin shortly thereafter. Having thanked the crew for their service, I made my way to baggage claim, where my bag was among the first off the belt. 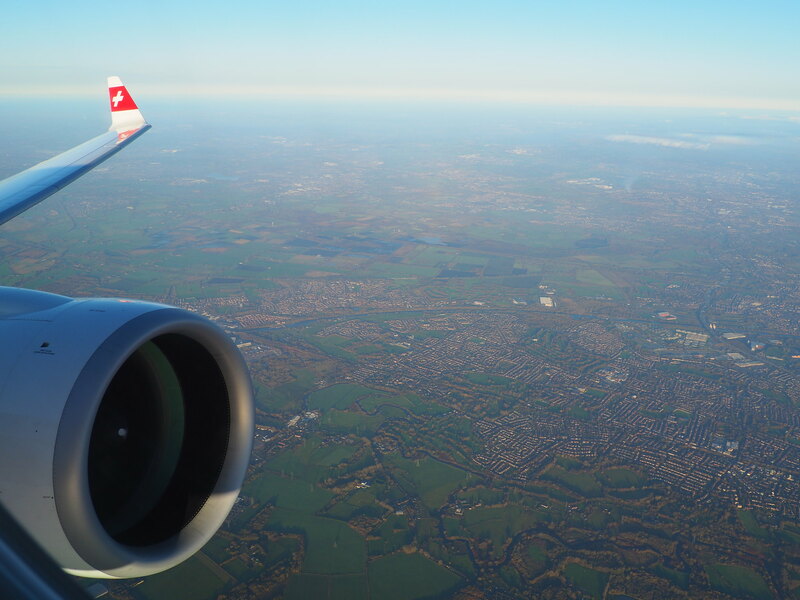 I was most impressed by SWISS' high standards of service throughout my journey. 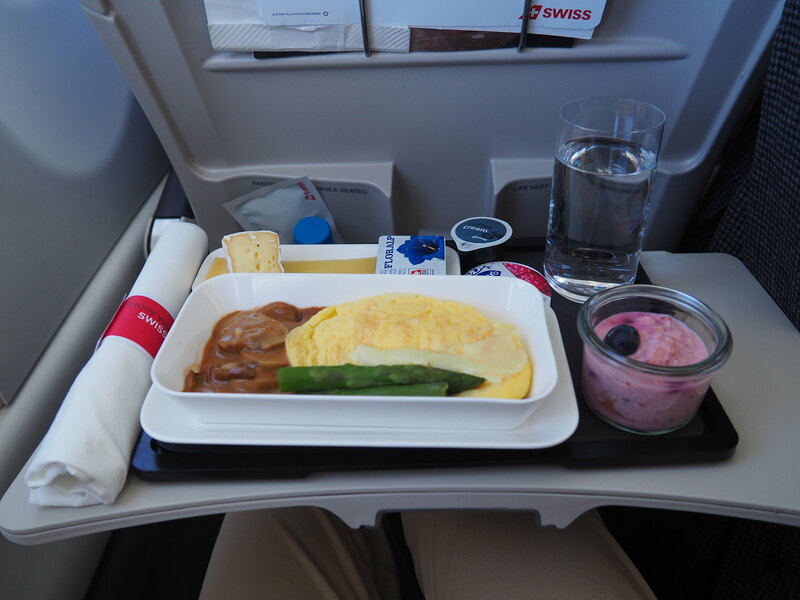 This is an airline which gets the little things right; from the presence of a chef in the Business Lounge to the distribution of chocolate at the end of the flight, SWISS creates and maintains a consistent premium atmosphere for their passengers. The in-flight service, meanwhile, was consistent, pro-active, friendly and highly-polished. In fact, my only real complaint about the journey was the Walnut Salad! The Bombardier C-Series, meanwhile, is a simply wonderful aircraft and objectively the best short-haul aircraft I've ever had the pleasure of flying on. I say "objectively", because subjectively my favourite remains the DC-9/MD8X/MD90 series and I have a significant soft spot for the Avro RJ and Fokker 70/100 aircraft. Looks like SWISS offers a great product on their short European flights like these. The food looks delicious! Good report, SWISS always seems very premium, the C series looks very nice too!